Looking to upgrade the sound of your axe? A new pickup set can supercharge your tone, turning a good guitar into a great guitar, while making even some of the most affordable axes sound high-end and stage-worthy. However, buying new pickups can be a complicated task, especially if you don’t know what to go for. Humbuckers or single-coils? P-90s or PAFs? Tele or Strat pickups? Piezo or transducer? And buying for metal – that’s a whole new world of pickup requirements! So, if you are in the market for a new pickup, you’ve come to the right place. On this page we’ve highlighted ten of our favorite models – a mixed bag of single-coils, humbuckers and P-90s, as well as pickups specifically for acoustic guitars. After the chart, be sure to stick around for our guide to pickups and how to find the best one for your buck. This section features links to our individual pickup pages, where we discuss single-coils, humbuckers, P-90s and more in greater depth. Let’s get started! Perhaps the passive humbucker set on the market today. An active neck humbucker with natural tone and epic output! One of the most famous humbuckers around. A superb single-coil to replicate Hendrix’s famous tone. Three very different Strat pickups, with huge power and versatility. A toneful Tele set with none of the traditional Tele flaws. Made to look and sound like original ES-330 P-90s. 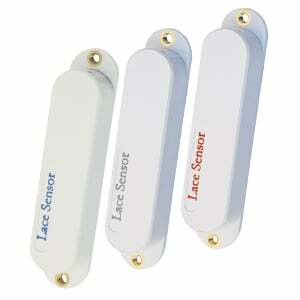 A high-end acoustic pickup system with awesome natural sound. Fishman deliver a quality soundhole humbucker. When you hear that Metallica legend James Hetfield worked with EMG on a high-output humbucker, you already know it’s going to be pretty epic. And that’s exactly how the set turned out. The first thing that strikes you is the awesome ‘stealth’ look, with brushed chrome cases that scream quality. Under the hood, things are excellent too. 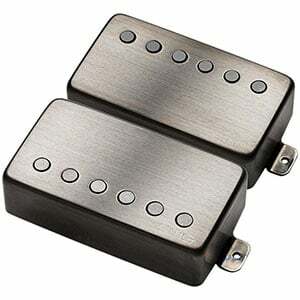 These passive humbuckers retain the warmth and meaty tone you want from a passive pickup, but manage to squeeze in the output and clarity of an active set. Tonally the two pickups differ slightly, with the neck offering a bigger attack thanks to its individual ceramic pole-pieces and bobbins, while the steel pole-piece bridge gives a tighter bass sound. One of the best humbucker sets around, delivering a consistently premium metal sound. Perhaps not as famous as its brother, the EMG 81, this awesome EMG 85 still rocks and makes a worthy appearance in our chart. Perfect for the neck position (although equally solid in the bridge), the EMG 85 features Alnico V magnet-loaded close aperture coils to deliver a natural tone with a huge output, with no loss of clarity as the volume is pushed to its highest. Tonally, it impressed in every area – a thick low-end, a defined mid-range, and a fat treble that makes this humbucker a real sonic pleasure, and particularly good for rhythm in the neck position. As you’d expect, it’s silent when not in use – hard to tell your amp is even on. Considering the quality on offer, it’s hard to fault for the price. A true Gibson classic! While a good deal subtler than some of the beastly humbuckers that come earlier in this list, this ‘57 Classic Plus delivers a rich vintage tone with bags of original PAF character that’s hard to beat for classic rock, blues and jazz. Great for both the neck and bridge, it features a slightly overwound special Alnico II magnet to deliver an output that is still hugely powerful, although raw aggression is replaced by a delightfully saturated crunch which remains smooth and clear as the volume increases. It’s very versatile in both tone and style, as it comes in both uncovered black or zebra styles, as well as the classic nickel or gold covers. An expensive pickup that proves a very good investment. No true Hendrix fan needs remining why the 1967 Monterey Pop Festival was such a landmark event for the iconic guitarist. And now you can replicate the famous tone of the Summer of Love with this modern reimagining of a classic single-coil. Made with Alnico II magnets, and great in all three classic Strat positions (the neck and middle in particular), the Area 67 is quite well-balanced, but very tight and bright with an emphasis on the treble. So, if vibrancy and mix-cutting lead tone is what you are looking for, this is the pickup for you. Another plus is that, unlike the original ‘60s single-coils, the DP419 Area 67 keeps things very quiet when it comes to background hum and interference. This interesting package from Lace Sensor is one of the more intriguing single-coil sets in our chart, but all-round very impressive in tone, matched by a remarkable versatility. The three pickups are all very different in their sonic abilities, making this perfect for so many styles of music. There’s a Blue in the neck, which offers smooth PAF-style tones. The middle features a Silver, which is very well-rounded and defined in the mid-range, offering the classic ‘70s single-coil sound. The bridge is where things get aggressive, with the hot Red, which delivers a thick and meaty humbucking tone that’s excellent for heavy rock. 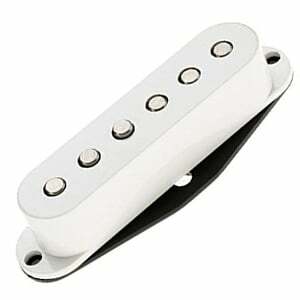 These covered pickups (in white, black or cream) look the part, and effectively keep hum very low. For the price, these are highly recommended. This excellent Fender-made Tele set marries authentic ‘60s Tele tone with the modern advantage of keeping hum and excess noise very low. However, despite their humbucking nature, these are very single-coil in their tone, with all the classic snap, twang and bite you’d want from a Tele pickup. The humbucking properties come from the clever construction, using special stacked Alnico V magnets, wrapped in enamel-coated magnet wire. 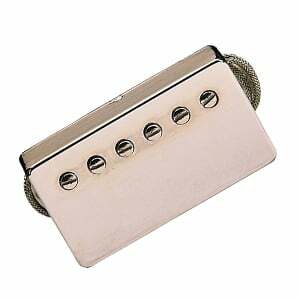 It’s a versatile set, with the bridge pickup offering good snarl and twang, while then neck pickup sports a nickel-silver cover, breeding extra clarity in the traditionally-muffled position. Great vintage cleans and a surprisingly hot output, these are great for heavier styles. This good-looking set can turn any Telecaster into a huge tone machine. Love the vintage tone oozing from the 1959 Gibson ES-330, but don’t want to (and can’t afford to...) splash out on an original? The Antiquity P-90 from Seymour Duncan is definitely a sensible alternative, offering a very similar construction. In fact, it’s the same hand-fabricated bobbin, Alnico II bar magnets and plain enamel mag wire that featured on the original. And with a similar construction comes a similar vintage P-90 tone, with plenty of brightness and bite. Available in both bridge and neck models, the Antiquities look the part too, with authentic-looking aged black plastic dog-ear covers. Great for lead and rhythm, with ample grit and aggression as the gain increases. It’s quite pricey for a single-pickup, but shows great value for the quality tone you receive. When it comes to amplifying an acoustic guitar, it’s hard to get much better than the excellent Anthem Tru Mic system from LR Baggs, combining an Element undersaddle pickup with a high-quality studio-mic to deliver a true, natural tone. In this system, LR Baggs actually make the noise-canceling mic the star, with the pickup offering extra depth. This is why the Tru Mic offers such a detailed replication of your guitar’s natural tone with super warmth. It’s also a system that keeps feedback at an all-time low even at higher gain. It’s expensive, but feels completely worth it, especially as you add in a versatile control system (easily-accessible from just inside the soundhole) comprising volume, a phase switch, and a mix control. Awesome. While not as high-end or pure in tone as the Tru Mic above (and, equally, nowhere near as expensive! ), the Rare Earth humbucker from Fishman still delivers a superb sound for any acoustic player. This active pickup features Fishman’s Neodymium magnets and sits just across the soundhole, combining to produce a rich, balanced and natural replication of your guitar’s tone. It’s versatile for strumming and fingerpicking styles, and is great for gigging guitarists as the humbucker keeps interference quiet. Note that a single-coil version is also available at a cheaper price, although this is less adept at eliminating hum. With simple, non-damaging installation, and a convenient onboard volume control, this is a highly-recommended system. Don’t know your single-coils from your humbuckers? Don’t worry, we’re here to help guide you through the different styles of pickup, as well as a few other factors that may help you make a decision. Many guitarists will accept their guitar as it is, and that’s fine. However, changing the pickups can breathe a whole new life into your axe – more so than any other component. The reason being that guitar manufacturers will usually look to keep costs down in the pickup department. This is particularly true for budget models, which will usually be fitted with stock pickups that do the job, but fall short of truly impressing. So guitarists with an affordable, but playable guitar may wish to upgrade their pickups, to make their favorite axe gig-worthy. Some guitarists, such as those who play heavy rock and metal, will want something with big heat and tons of aggression. Upgrading to a high-output active humbucker can add exactly what you’re looking for. On the other hand, some guitarists seek true vintage sound, so may look towards manufacturers that offer vintage-style P-90s or PAF-inspired humbuckers. These are generally lower in output, but big in tone. There’s also acoustic guitarists who want to amplify their guitars for performances and recording. Not all acoustic guitars come fitted with electronics – some brands leave them off to save money, while others know a pickup is a personal choice, so leave the decision to install them up to the individual guitarist. With this in mind, let’s look at some different pickups, roughly broken up into the following categories. There’s a big range of pickups on the market – all catering for different sizes and styles. Below – and in the individual pages we link to – we discuss some of the most popular types. One of the most popular and widespread pickups in history is the single-coil, played by more legends than we can count – from Jimi Hendrix and Eric Johnson, to Jeff Beck and Yngwie Malmsteen. Renowned for their delightfully bright and clear tone, the single-coil is exactly as the name describes – a single set of magnetic pole-pieces, wrapped in a thin wire coil. Simple in design, but complex in their sound, with exceptional dynamics, sparkling highs, and huge twang. They are great for all styles of music, from classic rock to country. Generally found on all kinds of models from a huge range of brands, single-coils are famously the exclusive pickup on both Fender Stratocasters and Telecasters. The DiMarzio DP419 Area 67 is a good example of a great single-coil pickup and a must for Hendrix fans, although check our dedicated single-coil category for more. The first popular humbucker was introduced by Gibson in 1955, and the world of music was never the same again. In general, the humbucker offers a thick, rich tone, with a medium to high output, which is why they are staple of heavy rock and metal (although equally popular in jazz music). You will find that humbuckers are used by everyone from Eddie van Halen and Dave Mustaine, to Jimmy Page and Dimebag Darrell. Humbuckers feature two coils wired out of phase with each other, and – as the name suggests – are used to eliminate the unpleasant 60-cycle hum that plagues many single-coil pickups. Gibson’s ’57 Classic Plus is a legend in the world of humbuckers, although be sure to check out our humbucker page for more excellent models. Since 1946, the P-90 has been pleasing guitarists with its vintage-soaked tone, that shares qualities of both single-coil pickups and humbuckers. P-90s are primarily single-coil in their construction (although larger and flatter), and come in a range of different housings. Although they feature a relatively low output, they provide a meatier tone than a single-coil, but with a bit more sparkle than a humbucker, and are therefore very versatile. They have been put to great use in rock, blues and jazz music, with Pete Townshend, Tony Iommi, and Carlos Santana all taking advantage of the sweet P-90 tone. On our chart above, the Seymour Duncan Antiquity is a great example, but check out more P-90 highlights on the dedicated page. The Fender Stratocaster is one of the most iconic electric guitars in music history, and its equally distinctive sound is down to its selection of pickups. Although you’ll occasionally find a humbucker, traditionally a Strat will feature three single-coils – one each at the bridge, middle, and neck positions. They offer that sweet, bright, chiming single-coil sound that’s perfect for all styles of soulful music – from blues and country, to classic rock – and are perfect for lead guitarists, as they slice through even the densest mix. There are some excellent Stratocaster pickup sets around, although be sure to check out the Lace Sensor Blue-Silver-Red set on our chart for something with a little extra edge. Like the Strat above, the Fender Telecaster shares the title of being one of the most legendary electric guitars ever produced, and owes a lot of its authentic vintage sound to its unique pickups – which are both fantastic and frustrating at times. A Tele will usually feature two single-coils: a smaller one at the neck and a larger, slanted pickup at the bridge. They both deliver a twangy sound, with the bridge offering great treble tone and the neck a little more balanced. The neck pickup’s main complaint is that it is often muffled in output – unless you find a good set such as the Fender Vintage Noiseless Tele Pickup Set, which keeps things crisp and clear. While Fender specialize in the single-coil pickup, it’s Gibson who are masters of the pickup in general – and it shows when you browse the chart in our dedicated Gibson pickup article. However, you’ll quickly discover that there is no ‘one Gibson pickup’, as the brand offer a wide range including single-coils and humbuckers, medium and high outputs, and vintage and modern tones. You’ll find different pickups on all of Gibson’s famous models, including the Les Paul, Firebird, SG and Flying V. Perhaps they are best-known for their PAF-style humbuckers – an awesome vintage tone that is well-replicated in their famous Gibson ‘57 Classic Plus. Looking for a super-hot, aggressive metal tone? You need a dedicated high-output humbucker that will crush any amp. Whether passive or active, it’s humbuckers that dominate the heavy rock and metal genres, offering huge power, mix-cutting melodic lead tone, and noise-cancelling abilities – just what’s need when the volume and gain increase. For gigging metal guitarists, humbuckers are pretty much essential. This genre has some great affordable options that will turn any axe into a tone monster, as well as some high-end signature pickup sets from legends such as Dimebag Darrell and Mick Thomson, while the premium James Hetfield Humbucker Set from EMG is one of the best purchases a gigging metal guitarist can buy! Finding a good pickup for an acoustic guitar is a real personal choice that will depend on your budget, style, aspirations, and the actual guitar you own – that’s why we’ve written a focused article on the best acoustic pickups. Among the myriad of acoustic pickups on offer, you’ll find the quickest to install are transducer pickups, which attach to the face of your guitar – an affordable solution, although the sound quality isn’t as advanced as others. A step up is both undersaddle and soundhole pickups, which have their own pros and cons, while – at the higher-end – you’ll find internal microphones and hybrid mic/pickup systems, which offer a beautifully rich, natural tone. A great example of one of these hybrid systems is the LR Baggs Anthem Tru-Mic. Whether you’re a metalhead or an acoustic virtuoso (or just somewhere in between), we can’t stress how important it is to have a good amplifier. You don’t need to spend thousands, but the higher quality your amp, the better your overall tone. Try to keep the amp relative to the quality of your pickups. For example, if you’re spending under $50 on a transducer pickup for an acoustic guitar, a basic acoustic amp will do you fine. But if you’re dropping around $300 on a hybrid system, there’s little point unless your amp can deliver the power and natural sound the pickup is capable of producing. The same goes for humbuckers and single-coils. If you’re in doubt, and have the cash, just buy the best amp you can afford – through a great amp you can make a decent guitar sound awesome. You may be questioning why we’ve not covered bass pickups in this article. However, to keep things simple, we decided to stick solely to guitar pickups. If you are looking for a new tone or more power for your beloved bass, check out our dedicated articles on Jazz Bass pickups and Precision Bass pickups for all you need to know, as well as recommendations. Whatever your reason for buying a new individual or set of pickups, we hope our chart, guide and dedicated pickup pages have given you some inspiration and a little more understanding of what to look for. Of course, there are many more pickups that we haven’t featured, but the ones we’ve highlighted will do a good job at increasing the tone, power and quality of your guitar – whatever your style. Make sure you take some time to read reviews and watch videos of your potential new pickup in action, and – if possible – hear them in person before investing your hard-earned cash. Whatever you go for, have a great time playing with your new pickups! Excuse me, but did u try the Kloppmann Pickups? in my opinion they really are the best every made Pickups. You really should make a test on them.